In the fifth (and last) of our suggestions for 2008, we would like to see some exploration of the possibilities of getting Hurtigruten (Norwegian Coastal Voyage) ships to extend their route, to have Stavanger or Sandnes as the southern end, instead of Bergen. This would mean extending the round-trip time by one day, so how are the current and projected load factors - might an extra daily ship be a good idea, rather than possibly building bigger? How much freight could or would be carried that way? What proportion of passengers would want to extend their trip down to Stavanger - and what proportion would need to, to make it economic? (With a loop through Lysefjord, this could become a one-night mini-cruise Bergen - Stavanger - Bergen for many visitors who cannot afford the time or money for the full cruise). 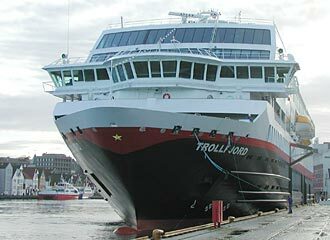 Is there a quay suitable to handle the hurtigruten boats on a daily basis? Sounds like fanciful dreaming? Why, when this is a lifeline that is taken for granted by nearly all of west and northern Norway?